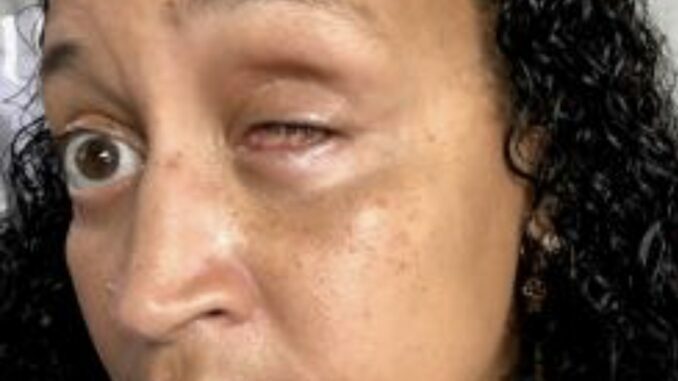 The Legal Aid Society on Monday called on Bronx District Attorney Darcel Clark to drop criminal charges filed against a woman who lost an eye during what she says was an unjustified beating by an NYPD officer. Pagan-Alomar, in a lawsuit filed against the NYPD, said the video disproves the police department’s claim that she assaulted Lustica. She alleges the officer threw her on the ground and savagely beat her with closed fists — while the key to her handcuffs was wedged between her knuckles. The blows knocked Pagan’s left eye from its socket and broke her orbital bone, her lawyers said. Read the Legal Aid Letter. Patrice O’Shaughnessy, Director of Communications for the Bronx DA’s Office, said the office will respond to the lawyer’s request. Pagan’s civil attorney, Michael Braverman of the Bronx, said prosecutors are offering his client a disorderly conduct plea to resolve the criminal case. But “she will not accept a plea to anything,” Braverman said. The civil case is stayed on consent, pending resolution of the criminal case, Braverman said. “It is one of the most egregious acts of police brutality I’ve encountered,” he said. The NYPD on Monday again pushed back against Pagan’s version of events. An NYPD source familiar with the internal investigation said that when investigators interviewed Pagan, she requested in writing that her complaint regarding Lustica’s use of force be withdrawn. Lustica, who works in the 46th Precinct, could not immediately be reached for comment. Pagan is next due in court April 1.